As the Argentinian season restarts after the winter break, the top of the Superliga has a rather unfamiliar look. Granted, league leaders Racing are no strangers to title challenges but just three points behind are surprise package Defensa y Justicia. 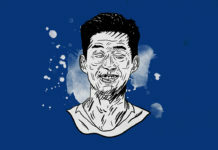 The small club from Florencia Varela have established themselves as a club that gives both young players and managers a chance and with an onus on playing attractive, attacking football since their promotion in 2014. Unbeaten in 16, they must now be considered serious contenders and the bookmakers are reflecting this in their latest football tips for the weekend. One of their leading lights and most consistent performers is young centre-back Lisandro Martinez. Born in Gualeguay in the province of Entre Rios, Martinez came through the ranks of famed footballing hotbed Newells Old Boys and represented Argentina at under-20 level at the 2017 Sudamericano. However, after just one appearance for La Lepra, Defensa y Justicia swooped in and offered him regular playing time with a one-year loan, making the deal permanent last summer. In the last year and a half, Martinez has been an ever-present for El Halcon, making 37 league appearances and scoring three goals, as well as featuring heavily in their run to the Copa Sudamericana quarter-finals. 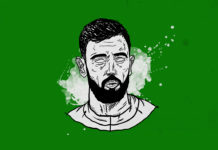 Boasting one of the better defensive records in the Superliga, Martinez has formed a fantastic partnership with Alexander Barboza, with both posting some of the best statistics of any player in the division. Given the lack of options at centre-back for Argentina, Martinez is someone whose development should be followed closely. 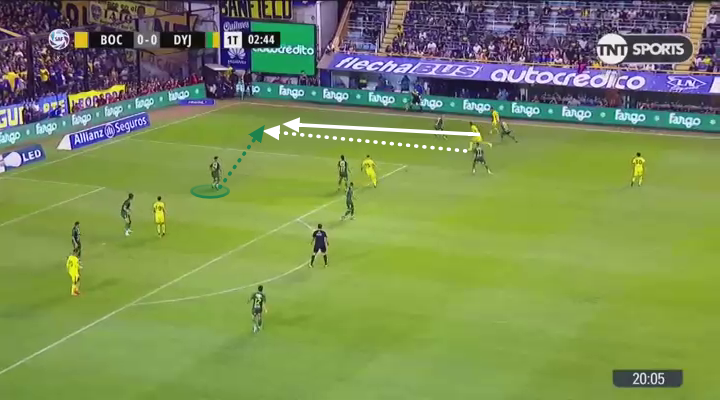 In this tactical analysis we look at what him makes such an interesting prospect and why he is such a key piece in Defensa y Justicia’s style of play. Defensa y Justicia have garnered a reputation for being tactically progressive. 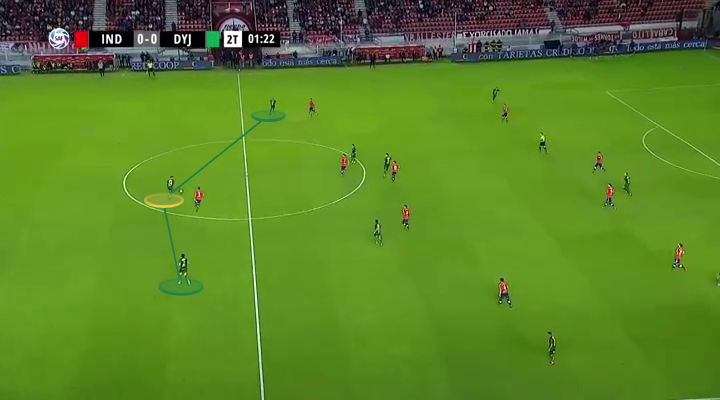 Under recent managers like Diego Cocca, Ariel Holan, Juan Pablo Vojvoda and current incumbent Sebastian Beccacece, they have often shown the flexibility to change formations mid-game. Martinez’s intelligence switching effortlessly from a back four to a back three or even to left-back has been key to the success of this flexible system. A left-footed centre-back, Martinez is just as comfortable on the left of a back three as a back four and can also drop into the sweeper role in a three too. Furthermore, he can operate wider and in tighter spaces, as is expected from any top-level modern centre-back. 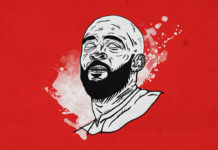 His positioning, reading of the game and understanding of different roles means that he makes plenty of interceptions, averaging 2.9 per game in the Superliga this year. Here we see Martinez reading the danger and sweeping up behind to intercept the cross and clear the ball. 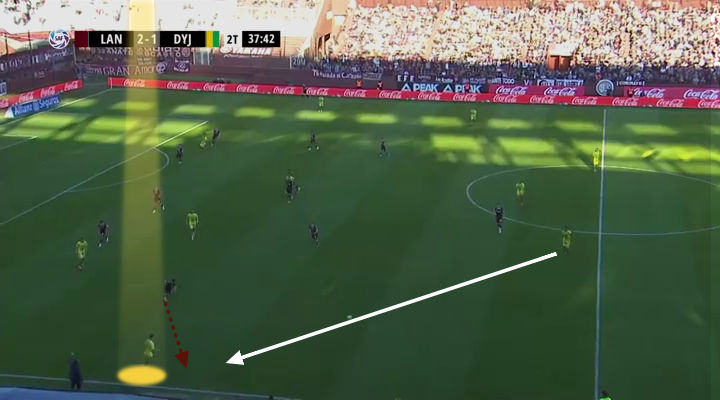 This tactical and positional intelligence is also reflected by the lack of cards he picks up. He doesn’t find himself out of position or needing to make rash challenges, demonstrating a good mentality and temperament. Part of what makes Martinez such an impressive young defender is his ball-playing ability and how he can launch attacks from deep. 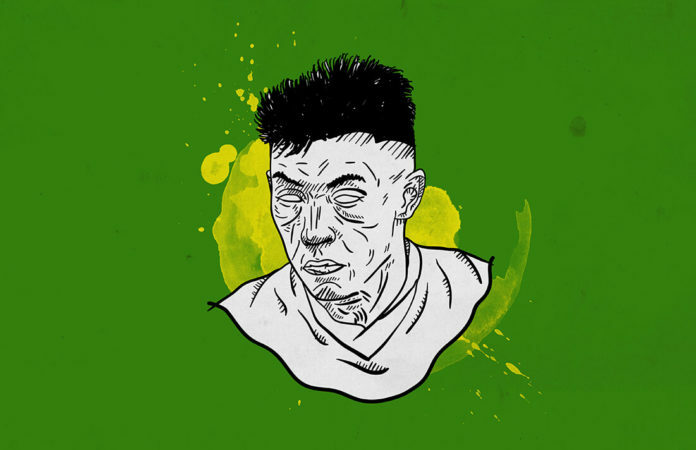 At the time of writing, he already has three assists this season in the league, the second highest of anyone in the Defensa y Justicia squad, and a more than respectable 80% pass completion. 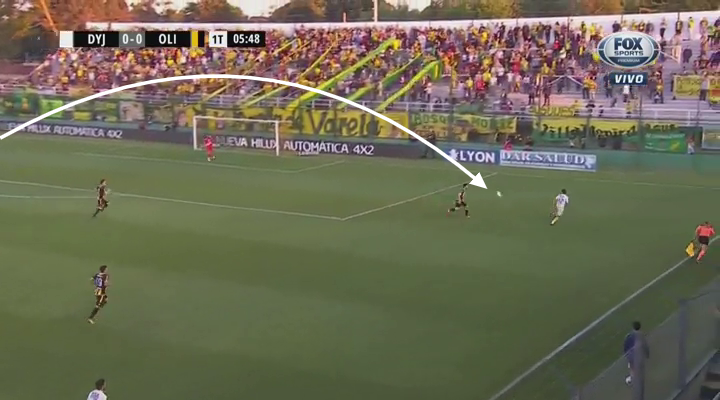 The latter stat is made more impressive by the fact that he doesn’t just look for the simple pass but often attempts long, searching diagonals which more often than not find their man. Martinez averages 6.9 long balls per game. 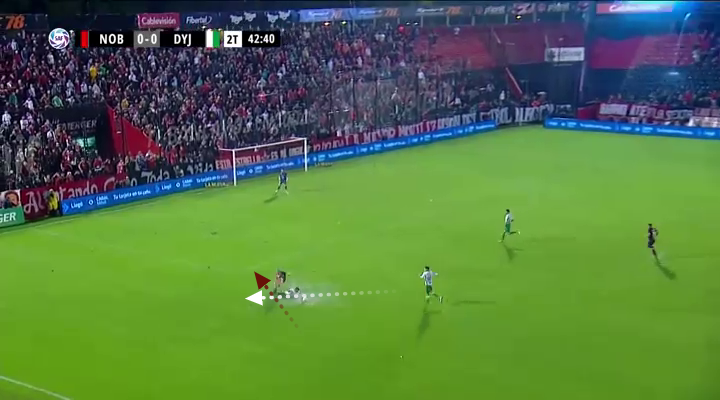 Of outfield players, only Argentinos Juniors’ Miguel Torren attempts more. 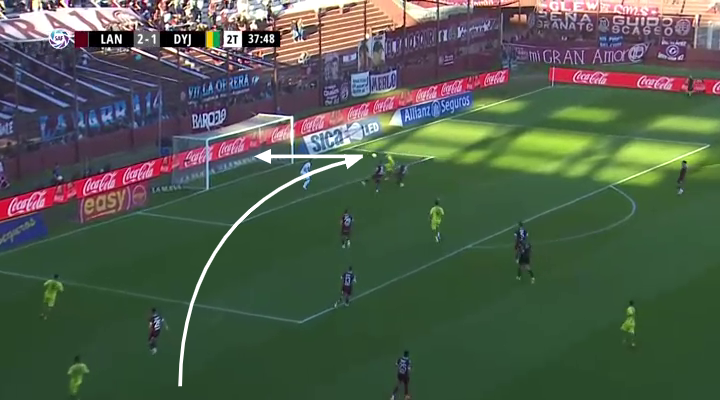 This contributes to the quick transitions and verticalidad of Defensa y Justicia’s pacy play. 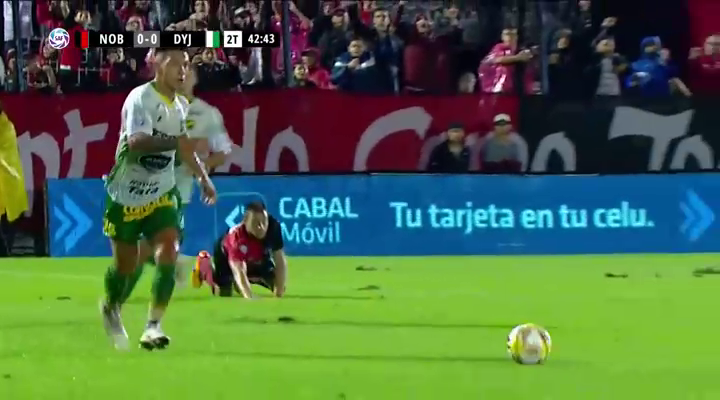 The ball lands perfectly on the striker’s foot, who controls expertly and finishes to give Defensa the lead. Again with see Martinez with time, space and no pressure, allowing him to pick out a lovely, long diagonal out of defence. 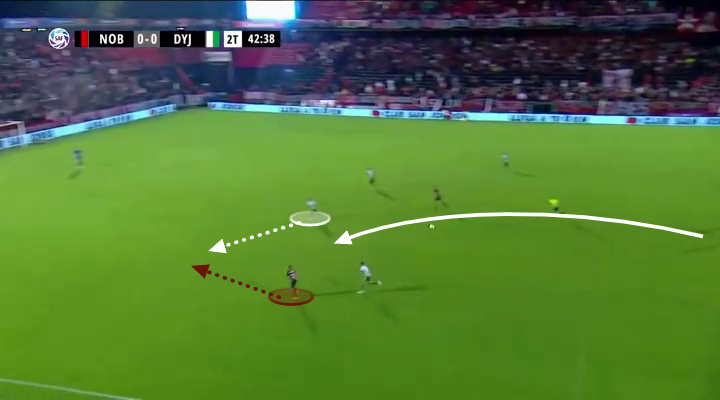 Martinez has the ability to break the lines with his forward passing out of defence and has been another key part of Defensa y Justicia’s style of play. No centre-back in the Superliga has made more key passes per game (14) than Martinez, and he has twice as many as the next best, teammate Alexander Barboza. 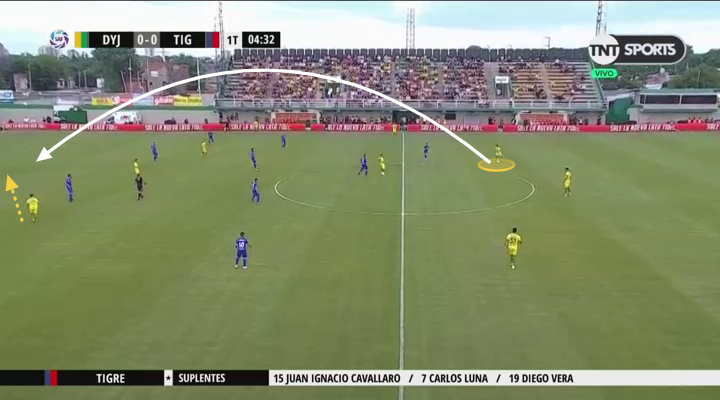 What’s more, Martinez’s ease at dropping into a left-back position also means he can showcase his decent crossing ability, as per the example above. Going hand in hand with his range of passing ability is Martinez’s comfort with the ball at his feet. Always looking to step out of defence and carry it forward, it shows that Martinez can break the lines in a number of ways rather than just through his incisive passing. Having developed a good balance and a turn of pace, Martinez’s time spent at left-back means that he has better dribbling than most centre-backs. He has a very cool, unhurried style when gliding forward. Naturally, this can lead to high-risk scenarios where he can be caught in possession or be caught high up the field, but usually the benefits outweigh the negatives. Rather than focus primarily on what Martinez can bring to the attacking phases of the game, Martinez is also very solid defensively. As part of a defence that has conceded nine times in 16 games he has averaged 1.7 tackles per game this season. As good as he is in the tackle, he usually relies on his ability to intercept instead. Martinez quickly gets across to cut out the danger, stays strong in the challenge without going to ground and is able to rob the ball and comfortably clear the ball. Being strong and quick across the ground, Martinez doesn’t tend to go to ground easily, preferring to try and play his way out of trouble. Having said that, he can also produce a big recovery challenge when necessary. Martinez is quickly up on his feet after the slide tackle and already bringing the ball forward, while all his felled opponent can do is look on. Probably the one question mark over Martinez would be his aerial ability. Standing 1.78m tall, Martinez is on the shorter side for a centre-back. While not necessarily a major issue, you could see it being an obstacle for a club in a top European league taking a punt on him. 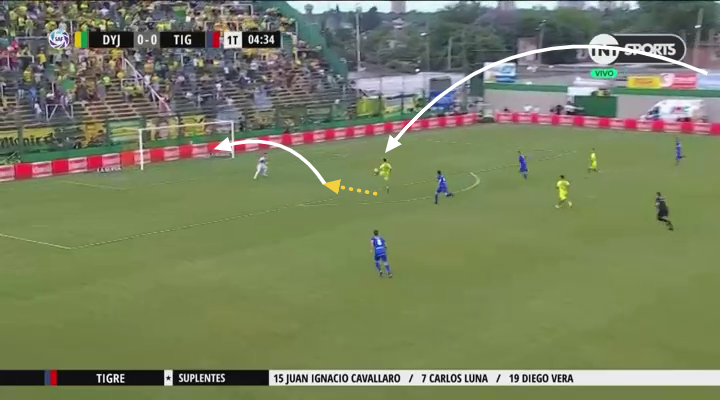 The solution thus far has been to pair him alongside a more aggressive, aerially dominant centre back – like Barboza at Defensa y Justicia – in order to find a good balance of defensive skill sets. Having performed consistently in the Superliga for 18 months now, the next logical step would be a move to one of the Grandes. While his teammate Barboza was not able to replicate his form during his brief spell back at River, Martinez looks better placed to make the step up. Both Boca and River are rumoured to be interested. They’ll have to be quick though because Martinez’s performances haven’t gone unnoticed and he could well find himself snapped up by a shrewd European club. At national team level, as a former under-20 international Martinez will be well-known to the hierarchy at the AFA and will no doubt being monitored as a player of interest. The fact that Argentina have been lacking options at centre back for some bodes well for Martinez. With the emergence of Juan Foyth, Leonardo Balerdi and Nehuen Perez, plus the likes of Marcos Senesi, Cristian Romero, Alan Franco and Lucas Martinez Quarta, there will actually be a lot more competition for places in the coming years. Nevertheless, if Martinez continues his current trajectory, there is no reason why he can’t be part of the conversation.